We hope this information is helpful! If you have any questions, please call us. Water is essential to all life...too little water and we die, too much and we drown. The same is true of the grass in our lawns. Water makes up 70% to 80% of the weight of our lawn grasses and the clippings alone are nearly 90% water. While most people are concerned about not watering their lawns enough,the fact is that more lawns are damaged or destroyed by over-watering. Newly installed turf grass sod has very important watering needs. Proper watering immediately after installation will ensure the turf gets established, and it will also have an impact on how well the lawn continues to flourish for years to come. 1 - Impact sprinklers can be about 10 to 20 minutes per set. 2 - Spray nozzles can be from 5 to 15 minutes per set. 3 - Start watering when the bottom of the roll starts to dry out. 4 - Stop watering when the bottom of the roll is thoroughly wet. 5 - Roots grow towards the moisture and nutrients. 6 - Over application of water will slow rooting. 7 - Under application may kill the grass. In the 40's (February, March, November and December) water once every few days. In the 50's (April, November) water once daily. In the 60's (April, October) water twice daily. In the 70's (May, October) water 1-3 times daily; 10 A.M., 1 P.M., and 4 P.M. In the 80's (June, September) water 2-4 times daily; 8 A.M., 11 A.M., 2 P.M., 4 P.M., and 7 P.M. In the 90's (Summer) water 5-7 times daily; 7 A.M., 10 A.M., Noon, 2 P.M., 4 P.M. 6 P.M., and 8 P.M. If the high temperature is in the 100's water 10-12 times daily during the day. 6 A.M., 8 A.M., 10 A.M., 11 A.M., Noon, 1 P.M., 2 P.M., 3 P.M., 4 P.M., 5 P.M., 6 P.M., and 8 P.M.
Watering Established Lawns...The amount of water required for an established lawn will be determined by its overall health, beauty and ability to withstand use and drought. One inch a week is the standard water requirement for most lawns (when hot in the summer); however, this will vary between different turf species and even among cultivars within a specie. There will also be varying water requirements for seasonal change and still more differences brought about because of different soil types. Some helpful advice, look at your lawn to determine if it needs water. Grass in need of water will have a grey-blue cast to it, rather than a blue-green or green color. Also, foot prints will still be visible after a half-hour or more on a lawn in need of water, while on a well watered lawn foot-prints will completely disappear within minutes. You can also use a soil probe, such as a screwdriver or large spike to determine how deep your lawn is. If the probe can be pushed into the soil easily, it's probably still moist, but if it takes a lot of pressure to push in, it's time to water. Remember too, just because your lawn turns brown during extremely dry periods doesn't mean it's dying; grass will go dormant during such periods but it still requires at least one inch of water per week. Your lawn doesn't have to be green to be healthy. 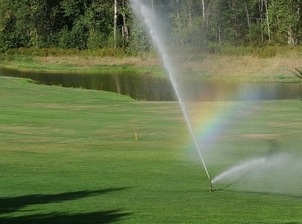 For more watering advice you can visit http://www.TurfResourceCenter.org. At 90 degrees a landscaper watered 2 hours each time 2 times daily from 6-8 A.M. & 6-8 P.M. (4 hours of water a day). The result was muddy low spots and dry dead high spots. At 110 degrees, watered 12 times daily for 15 minutes. (3 hours water daily and 20 degrees hotter). The result was green grass that wasn't stressed even though it was hotter and had less water. WHY: because it didn't dry out during the day! • The average toilet uses 5 to 7 gallons of water per flush. • A shower can use 25 to 50 gallons (5 gallons per minute). • Just washing your hands can use up to 3 gallons of water (with tap running at 3 gallons per minute). • Leaving the water running while you brush your teeth can waste 3 gallons of water (at 3 gallons per minute). • Outdoor spigots can pump out 5 to 10 gallons per minute. • Automatic dishwashers use about 15 gallons per load. Washing one load of clothes in an automatic washer uses about 45 gallons. The average person uses about 125 gallons of water per day. About 340 billion gallons of water are used every day in the United States. This total includes water used in irrigation, in industry, and in fire fighting and street cleaning. It takes about 1 gallon of water to process one barrel of beer. It takes 39,000 gallons of water to manufacture a new card, including tires. A faucet that drips 60 times in one minute would waste over 3 gallons a day, 1,225 gallons per year. A human can live more than a month without food, but only as much as one week without water.